I've just returned from a quick visit to the family in South Florida. Very pleasant weather - it was great to sit by the pool and chat last night. However, I read a pretty sobering perspective on their housing market this morning. There are several forecasts for a 15% decline in housing prices there in the next year. The writer couldn't resist a little boosterism, reminding her readers that home values there had increased 181% from 2000 - 2006 so a little fall in equity shouldn't hurt. I'm sure that'll make all her readers with an "impossible to refinance" subprime mortgage feel great, like her fellow columnist profiled in the same issue. Marc Thomashaw, vice president of Realestat.com, which tracks local mortgage figures, put my situation into perspective. In Broward County, he said, "There were over 200 pre-foreclosure listings in January '06 and over 2,000 by December '07. It's really bad out there." Sales volume. Overall, down 18.1%. 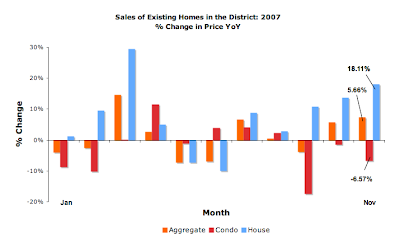 YoY, condo and home sales volume dropped, 15.33% and 20.77% respectively. Sales volume was negative across the board. Condos represented 50.77% of the units sold. 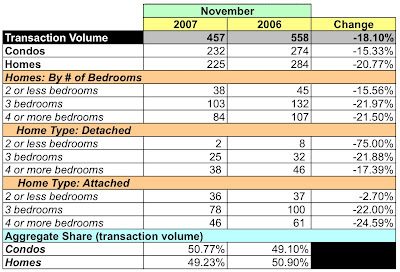 From October to November, volume fell 1.51% for condos and rose 17.23% for homes. Dollar volume. In aggregate, down 12.12%. YoY, condos were down almost 21% whole homes were down 6.43%. 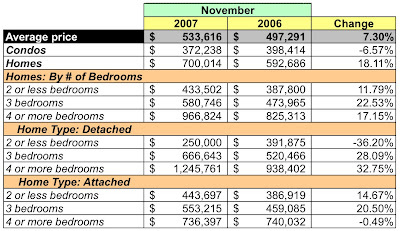 A closer look shows that, except for 4+ bedroom detached homes and 2 or less attached homes, dollar volume was negative for all types of housing. 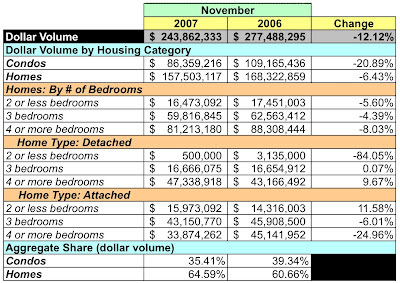 Condos' share of the dollar volume, 35.41%, fell compared to November 2006. Average sales price. Overall, up 7.3% YoY. Condos fell 6.55% to $372,238 while homes increased 18.11% YoY to $700,014. Days on market. DOM is 68 days. A closer look shows that slightly more than 60% of all homes sold within 60 days, a performance metric that's been pretty consistent these past few months. Inventory. Based on the month's transaction rates and active listings, there is a 6.82 month supply of condos, a 0.12% drop from October, while home inventories are at 7.66 month's supply, a 6.86% decrease from October. 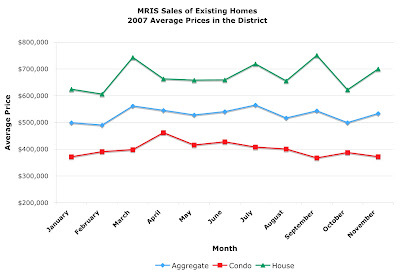 Looking at the pricing trends chart [see below], 2007 may still turn out to be a good year for single family home; average prices are +12.15% Jan-Nov. It's a different story for condos. After the exuberance of the past few years, 2007 will be as flat as three day old champagne at a condo marketing event: +0.07% Jan-Nov.